If I don’t say so myself, blue cheese, bacon, and mushroom pie is the most incredible tasting pie I have ever made. 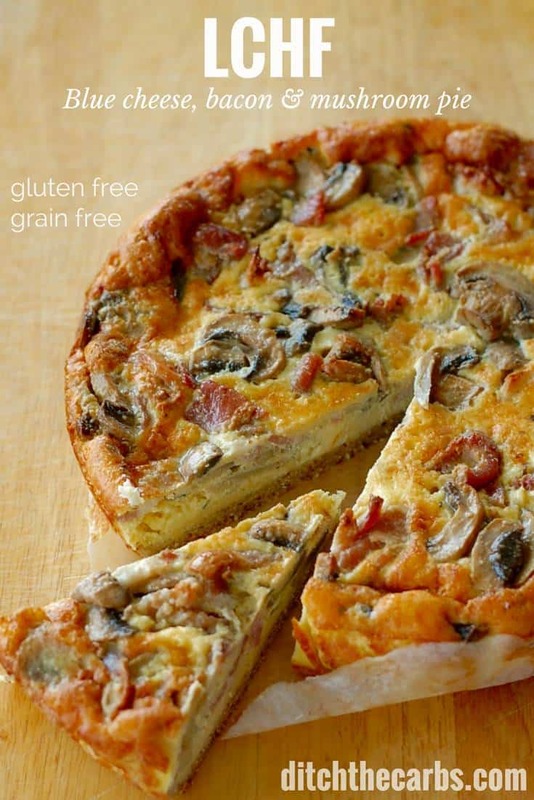 It’s healthy, low carb, gluten free, and grain free. And it’s only 3g net carbs per slice. This simple pie uses my grain-free pie crust that doesn’t even need rolling out – see how below. 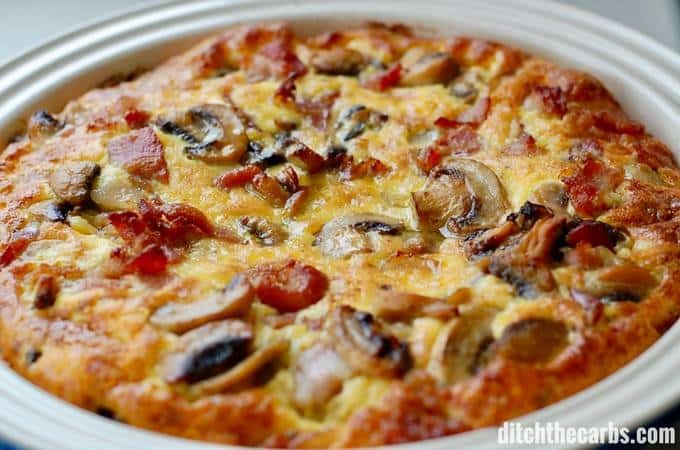 A simple yet tasty and blue cheese, bacon, and mushroom pie is a rustic family dish perfect for winter family meal or brilliant for a summer’s picnic. It is sturdy enough to survive the school lunch box too! My trick to ensuring the filling is evenly spaced, is to pour the blue cheese mixture onto the baked pie crust first, then sprinkle over the cooked bacon, garlic and mushrooms. It works every time. If you don’t like blue cheese (what is wrong with you) you can always swap it out for your favourite cheese. You can also swap the bacon for pancetta or another flavoursome meat. This would even work with pepperoni slices too. If you love pies, you may want to look at my recipes for spinach and feta pie (with a quick cooking video), crustless bacon and egg pie, chicken and leek pie or my salmon quiche. All are easy to make and are brilliant for leftovers. I often will make one of these pies for school lunches, then I am ready for the week ahead. Serve the blue cheese, bacon and mushroom pie with a leafy green salad and homemade mayonnaise. This is the perfect pie for winter dinners or a summer picnic. Packed with blue cheese, bacon, and mushrooms makes this pie an incredible tasty and sturdy. if you don't like blue cheese, simply swap for your favourite cheese. Mix all the ingredients together with a fork. You can watch a short video here. Grease and line a 24cm/ 9.5 inch pie/flan dish. Place the pie crust onto the lined dish. Place a piece of baking paper on top and smooth out the pie crust with the back of your hand or a glass tumbler. Remove the top baking paper. Make holes all over the base with a fork. This will help the pie crust bake evenly and brown beautifully. 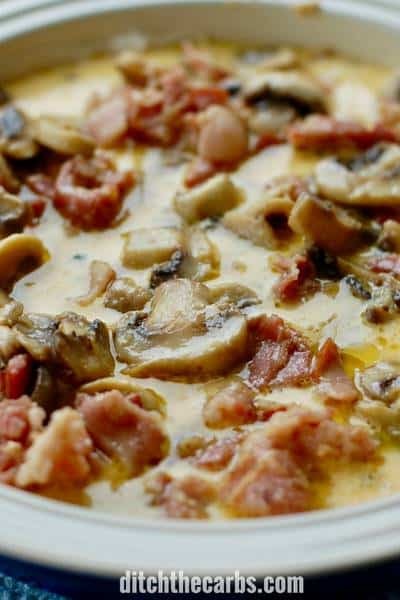 Heat the butter in a frying pan and gently fry the garlic, bacon and mushrooms until soft and cooked and any water has evaporated. Remove from the heat to cool down. In a mixing bowl, mix the lightly beaten eggs, heavy cream and blue cheese. Pour over the cooked pie crust. Bake at 180C/350F for 20-30 minutes until cooked in the centre, but do not overcook. 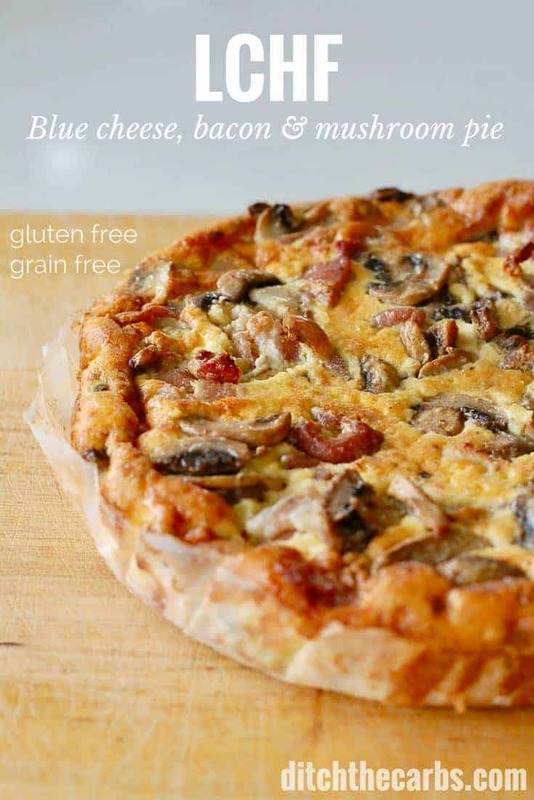 What other flavours or ingredients would you add to the blue cheese, bacon, and mushroom pie? 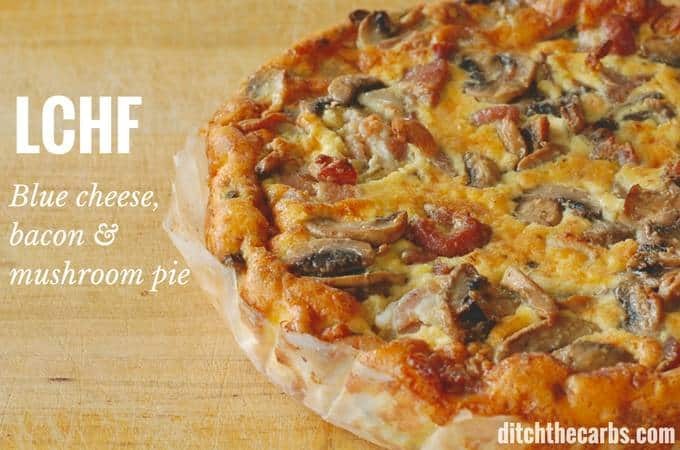 Is there a family favourite pie you would like me to convert to be low-carb friendly? If you are new here, why not head over to my closed Low Carb Support Group. It’s free and we’re a friendly bunch. See you there. I made this in the weekend & it is delicious however my crust came out chewy. What am I doing wrong? I’m keen to make it again because it is so delicious. Did you bake the crust first? Perhaps it needed a few extra minutes? Can the blue cheese be substituted with mozzarella? That might be a nice substitution. The blue cheese is to give the pie a real punch of flavour, but if that’s not to your liking then mozzarella will work. Or any other favourite cheese. It’s quite an adaptable recipe. Hiya. OMG this looks amazing. My only problem is that I can have cream. Could you sub this out for something else? You could probably omit the cream entirely, however, the pie may turn out a little more solid than mine. We don’t like mushrooms. But this sounds delicious. Gonna figure out how to modify it using maybe spinach. Libby..hats off to you and your out of this world keto recipes. I made this pie yesterday and OMG it was so delicious that i went above my macros just to eat one more slice and I dont even regret it😍The crust was just perfect and so was the filling .. I enjoyed it with a hot cuppa tea and just instantly went to food heaven😁!!!! Thanks again for this delicious recipe !! I’m veggie so I used two Quorn gammon steaks instead of the bacon which added two carbs to the whole pie. This isn’t just good. It’s an outstanding recipe. I’ve been low carb for a long time and it’s ages since I tried a new recipe that I know I’ll make again and again. Thank you . Thank you. Thank you! I don’t eat pork (it doesn’t agree with me), so I replace the bacon with smoked chicken, works really well. This is one of my go to recipes for when I need a lunch that doesn’t require eating. I take what I need and freeze the left-overs, so it’s an even easier lunch for other times. I made this without the crust. I just lined a disposable pie pan with parchment paper and added the ingredients. It turned out great! So good! Will definitely make again. Thank you. Any idea how this freezes? Sorry if this question has already been asked I did have a look. Looks so delicious going to make it tomorrow! I have frozen a couple of slices and they were still pretty good when defrosted and warmed in the oven. Really did not care for the crust – too mealy/granular. Has anyone tried this recipe substituting fat head dough for crust? Hi! I made this pie last friday and it was amazing!! It was meant for Saturday’s pic nic lunch but it didnt survive hahahah. One question, can i use milk instead of the cream? Or any other replacement? Thanks! I used 2 tablespoons of coconut cream, then filled the rest of the 1/2 cup measure with full-fat coconut milk – it worked perfectly. That’s my standard substitution for heavy cream since I have a casein allergy. You could also use a mild-flavor yogurt if you have some of that on hand. The ‘heavy cream’ part isn’t picky. FYI – The short video did not load after watching the Lego ad. Not sure if the link is broken or what. I’m afraid there isn’t a cooking video with this recipe unfortunately. You may have clicked on an advert? Fabulous! I had all the ingredients so I made it today. I am so happy with the base. It held up so well that i could pick up a slice and eat with my hands! It tasted great. Will make a few variations for my kids, who sadly hate mushrooms. I’m going to slice it up and freeze portions for my work lunches. Great recipes Libby. I’m a regular on your website. Can you suggest a substitute for almond flour for someone with tree nut allergies (all tree nuts) ? It is the go to for so many low carb recipes I have no idea how or what to use in its place. I have just started a new category for coconut flour recipes, click here to see them all. They are recipes either made with coconut flour, or which have a conversion to use coconut flour in place of almond flour. I just found quinoa flour in the shop, can you replace almond flour with that? What about hemp seeds instead? It was absolutely delicious! I will certainly do it again. Thank you! I made this pie last night exactly as written and it was wonderful. I actually added some Mobay cheese to it too (half goat, half sheep milk cheese). Thank you for the recipes! !